Nicky and Cecil sit down next to us at some point as we are contemplating our woes – they arrived some time back and are already showered. We chat for a while before T heads off to find a shower for himself. The rider who was battling across the rollers after WP6 also pulls in as I potter around. As we chat it becomes clear he’s suffering from the onset of Shermer’s Neck. After my LEL experience I know there’s little that can be done aside from offering sympathy and saying I hope he can battle on. The chances don’t seem great that he’ll manage to stave off full blown Shermer’s though with so many hours on the bike still remaining. [18:06, 11/30/2018] Nico Coetzee: Wat ruik soos snoek? He must have encountered the same dreadful conditions over the last section into the RV as we did. Lying back my eyelids feel suddenly heavy and I’m already beginning to drift off by the time T returns and thinks to close the curtains. We’ll be up well before dawn but it’s probably an hour before darkness falls fully. Lying there in the dim twilight, my knees and back are screaming. I know the torture will pass after a few minutes, but it’s so deeply uncomfortable that there is no lying position which makes it any easier. In the end I resort to flat on my back which at least stretches everything out. I forget which of us woke the other with their impressive snoring. I do remember T having a particularly expressive bout at some stage in the night – a crescendo of progressively heavier breathing, followed by a “nee fok” as he crested whatever imaginary hill he was climbing. I’m sure mine must have been just as loud and entertaining. It’s way too early to be thinking of getting up, but the alarms signal that we’ve had as much as we are going to get even if not as much as our weary bodies would like. The kitchen stuff had sounded a little uncertain when I inquired the night before about the chances of food at 1am, but the dining hall is bright and alive and hot cooked food and toast is already being brought out to the handful of grateful riders sat at one of the long tables. Slugging down hot coffee, and smearing my toast with butter and apricot jam I’m sure I must have remarked to T how spot on the RV catering and facilities have been. This is a stupidly tough race, but without these refuel stops it would be near impossible for average riders like us. A lone ride sits stiffly upright in a neck brace at the end of our table. It’s not the Shermer’s neck guy, this chap’s injury having been caused by a fall. It’s incredible he’s even considering continuing, but he’s adamant that after some rest he’s going to ride on. I forget whether it was Cecil or Nicky who commented that despite having done several Cape Epic’s, this was tougher than anything they’d ridden. I can only take their word for it, never having been confident enough of my technical skills to tackle one myself. Before we get up to pack, one last piece of advice is shared by one of the guys. They had a message from Benky warning them to save something for the final, tough climb into Sutherland. It’s just a throw away comment, nothing more, but added to the many abandoned farm buildings it makes me feel sad – a sense that we are riding through a way of life that is slowly vanishing. I wonder how much longer the harsh landscape will sustain this population of generous and welcoming farmers and town’s folk. It brings home to me what a privilege it is to be undertaking this journey now, surrounded by like-minded fellow riders and in the company of a best buddy. Against this thought, the many lingering pains in my body suddenly seem insignificant as we sign out of the RV, and roll out into another dark morning. My spirit is too full of adventure and gratitude to dwell on something so transitory as a discomfort that will be over, too soon. The last words we heard from the RV staff. Although we can’t see anything apart from the gravel directly ahead, it’s clear from the terrain what they were talking about. As we leave Loxton behind, the road rises gradually but almost constantly upwards. We’ve been slogging slowly for a few hours by the time a faint orange ring of light begins to spill over the hills to our left. The hours of dark riding have at least put the bulk of the grind behind us, although we’re still 10km or so short of the WP when the road swings right, directly into the teeth of a wind that seemed to spring up from nowhere. 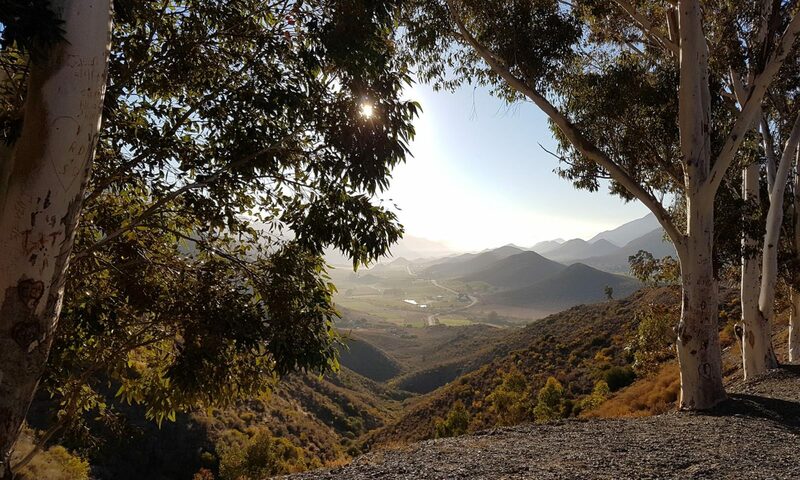 There’s a real sense of being up in the Karoo Highlands – a uniform landscape of low shrub like bushes, the few trees which do break it up stand as announcements of an approaching dam, or farmhouse. One of these sits invitingly up ahead in the lee of a small hill which the gravel road rises up and over. It’s the turn off to the next water point, and I’m hoping T spots the flags and turns off. He’s managed a better pace against the headwind and is a few hundred meters ahead. Fortunately he’s just as alert to the presence of some rest and sustenance as I am, and I see his small, distant outline fork right and spin down towards the verdant green of the farmhouse lawns. Confusingly, I spot the recognisable Jones H bar of Pieter’s bike propped up by the wall as I dismount. We have crossed a few times since the first night of riding, but he was heading out from Loxton yesterday afternoon as T and I were pulling in. He ought to be several hours ahead of us along the road by now – clearly something must have happened along the way. We head into what looks like a garage of the farm, where a young girl helps us to food and coffee from the tables set inside. The mattresses are empty, but the girl mentions a rider abandoned with bronchial issues in the night along the stretch we have just ridden. He was collected and driven to the waterpoint and is inside sleeping as we stoke up. It’s a terrible shame that Pieter’s ride has ended here, and a reminder of just what an extreme assault on the body this ride is. T and I are tucking into coffee and muffins when Cecil and Nicky pull in. Nicky says she’s been battling the dozies ever since leaving Loxton. She mentions finding herself staring into the hypnotising rythmn of Cecil’s whirring pedals and wheels and battling to keep her eyes from closing. I suggest she drinks a coffee before her nap but the words are lost and she’s already heading to stretch out on a mattress. We don’t stop long, but at some stage there must have been some posing for photos resulting in a rare shot of T and I actually during the ride. I also recall the farm owner sharing some highlights of the lead riders as they passed through, many hours before. It’s incredible to think that the winner (Ramses Bekenk) has already finished. His time of 50 hours is a shade longer than the two days we contemplated as possible back in Bloem. But the lessened heat and favourable wind have demolished the previous record as we’d guessed. 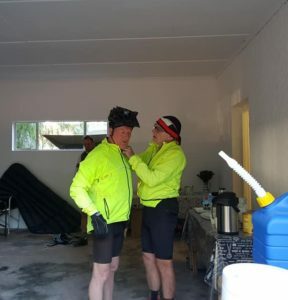 The owner recounts how he was already battling lack of sleep as he passed through this waterpoint. The route rolls past and through the rest of the gardens and out onto a short section of farm track that loops around to rejoin the gravel district road. Handily this avoids the small koppie it was busy climbing when we ducked left to the waterpoint. 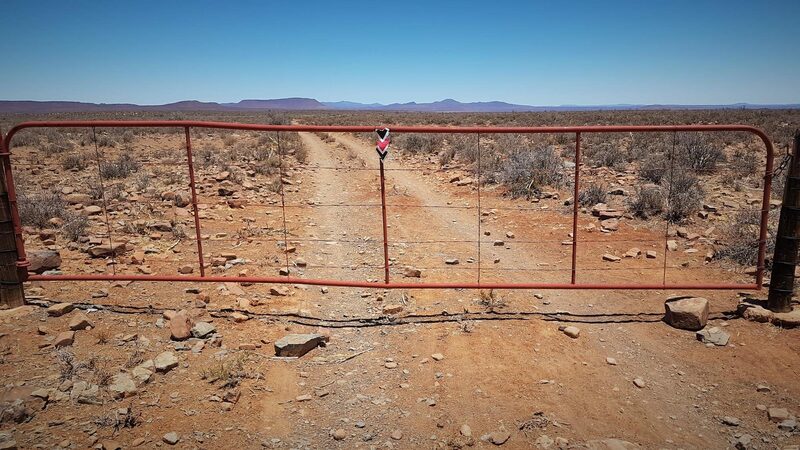 It’s a small relief, but the road continues to roll and rise gradually across an enormous expanse of open Karoo. Time and space are utterly lost on me here. I recall rising up to a ridge ahead, passing a farmyard with a farmer out working on his tractor who returns my possibly over enthusiastic greeting wave. I also vividly recall Cecli and Nicky spinning easily past me on one of the uphill sections and commenting that seated pedalling would be easier on my Achiles. In theory at least, they are definitely correct but somehow it doesn’t feel that way. Standing, whilst also uncomfortable, oddly doesn’t seem to exacerbate the ankle pain as much as a proper spinning cadence. It doesn’t make sense, and maybe it’s a short lived and false impression, but it keeps the wheels turning so for now I go with it. At least today we will actually encounter that stop of Fraserburg, midway between water points. As we finally reach and crest that distant ridge the church spire and outline of town buildings are just visible peeping up through a shimmering haze of heat. It’s a long, savage slog to get there. 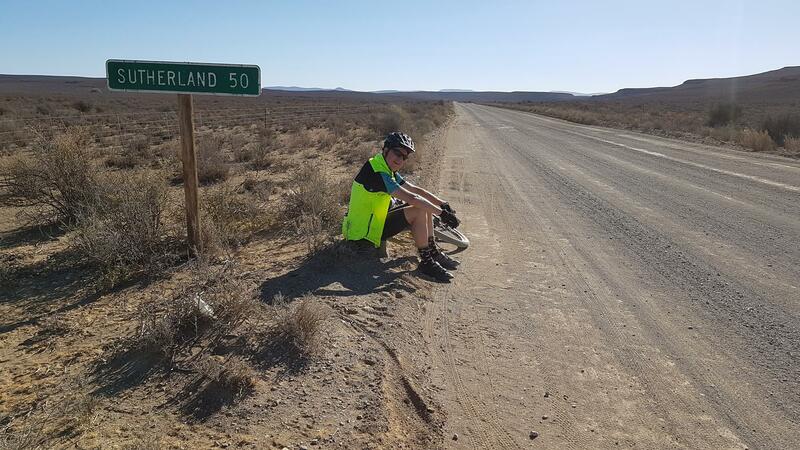 I comment to T that it feels like the never ending stretch from Porterville to Piketberg on our Cape Audax 400 – the town constantly visible, but seemingly never any closer. At some stage I tell T to push on ahead and grab us a table at whatever coffee stop is open – my right ankle is now a flaming ball of pain and there is nothing left in my legs. I watch as his flapping lumi-green jacket slowly edges away from me, he at least is closing some ground on the perpetually distant line of buildings. It feels like an eternity between seeing his jacket disappear into the town and reaching the first houses myself. I wave at a woman hanging her laundry in a garden to my right. I’m moving so slowly we could have had a full on conversation by the time I pass onto the next small fenced off plot of RDP housing. But the wheels start to run free as they roll up onto the smooth black tarmac, and a fresh surge of energy and optimism flow through me. Better still there’s one of the ER24 ambulances parked up ahead. Maybe they can strap up my ankle. It turns out that T has asked them to wait for me, but I’m out of luck on the strapping front. They’ve treated so many battered knees and ankles that they are clean out of bandages. They do at least have heat rub and after searching a couple of shops to find where T has parked himself, they set about an extensive Deep Heat massage of both ankles. In the end, I get the full works and a neck and shoulder rub as we wait for milk shakes to arrive. The coffee shop is a divided off section of the town general store, and by the time we’re ready to roll again we’ve also sampled some excellent bacon and cheese toasties and coffee as well. A couple of locals have been eagerly interrogating us as we sit and eat, they know all about Munga, but still seem incredulous that anyone would try and ride it. I know the ankle relief is probably temporary, but it’s effective and combined with the food and drink is enough to restore my spirits. It’s a good job too – we ride out into a raging furnace as we leave the town behind and grind our way up another steady gravel incline. I forget exactly what T had to stop or turn back for – perhaps his gloves. Either way, it doesn’t take him long to retrieve them and pass me again such is the slow pace I’m managing. He’s chatting with a farmer at a parked bakkie as I catch up with him. The farmer has stopped to change a shredded tyre on his trailer, and within moments what we take to be one of his friends or neghbours pulls up behind to assist. We stand there conversing in Afrkiaans, or rather T does – I can follow the exchange, but mostly I’m listening. I remember looking into a shining smile from the older of the two guys – his tanned and weathered leathery face testament to a lifetime of working this unforgiving land. Their knowledge of our race is amazingly comprehensive – they seem to know about every detail and turn, who’s won it before, who’s where on the road now and what lies ahead for us. It’s a little humbling that they seem impressed by our participation, despite us being almost last in the field at this stage. Sure enough, their description of the immediate terrain ahead proves exact. Just after we wave goodbye to them, we leave the gravel road and turn left onto a private farm track. It starts out as pleasant, rolling track around occasional farm buildings and guest cottages, and heading slowly into ever more scenic but remote feeling terrain. Before long it becomes clear that this is actually the 30km of gnarly track mentioned to us by the ER24 staff at WP6 yesterday. After a couple of short, manageable steeply rocky ramps, a long and sweeping downhill section leads us into a deep ravine, surrounded by cliffs and rocks, but not completely deserted. Smoke rises from a cluster of small buildings just before we begin to climb steeply out again. The track is just too rocky and steep for me, and I abandon hopes of riding the whole section, trudging up the steepest part before mounting up when it becomes rideable again. At the top of the climb, we ride out onto the Moon – or maybe it’s Mars. Either way, the desolate expanse of red, rocky land in front of us doesn’t look much like anything vaguely recognizable as Earth, The galactic sense is amplified by a glinting dome on the far horizon. T is first to spot it, the outline of one Sutherland’s telescopes. It’s an impossibly long way off and the thought of needing to ride there today, in our currently battered conditions would be utterly demoralising were it not for one small fact. The peaceful serenity of this magical desert-scape is absolute. Our bodies are sore, it’s hotter than hell, but it’s impossible not to be in the highest of spirits about just being here. I don’t know how many times we commented on what a rare treat this day was, but it was probably in double figures. Sure, the track was trickily technical to the point of us walking down boulder strewn sections at times. And in places, the sand and corrugations were maddening. 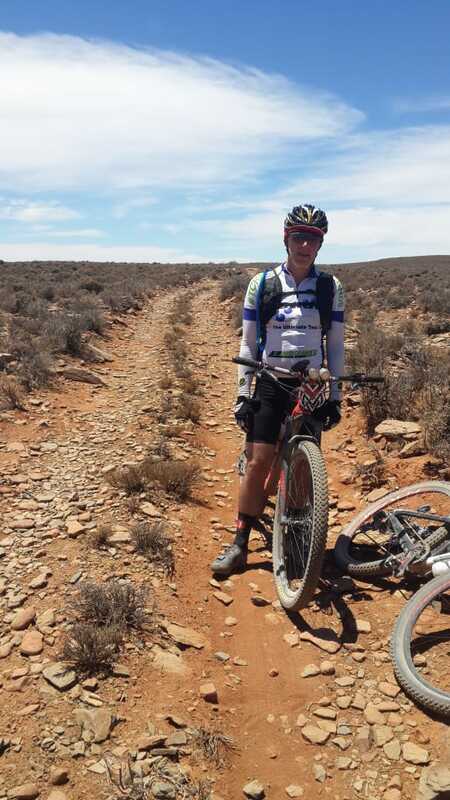 But overall what was billed as an ugly 30km proved to be one of the most memorable sections of the ride. I’m somewhat disoriented by the time the purple line on my GPS indicates the track is ending and we will soon rejoin the district road we left outside Fraserburg. For a few moments I begin to imagine a nearby white building is the entrance to the Sutherland observatory site. But the first green road sign we see dispels this notion – we’re still 70km from Sutherland, and our direction now has us pitted directly against a worryingly strong headwind. At least the stand of trees and cluster of buildings around 5km ahead does prove to be the outline of Celeryfontein, the next waterpoint. It becomes a cliché describing every waterpoint farm as an oasis. The trouble is, it’s completely accurate. The style of each is very different – WP8 for instance is a beautiful old Cape Dutch building, twin gable-ended barns with white walls and a thatch roof. But passing through their gates brings the same sense of overwhelming relief – refreshingly cool air under shady trees, green lawns, and welcoming hosts at tables loaded with cool drinks and food. At Celeryfontein, we languish under the boughs of one enormous broad leafed tree (perhaps a maple). As well as the chairs we are sitting on, and the usual mattresses (one of which is occupied by a development rider having a snooze) there’s an actual steel framed bed. Although at present the farm Jack Russell is guarding it with a possessive glare in his eyes, and at varying times one of three adolescent lads who are helping out is sitting or lying there. I’m sure all of them would have vacated for us if needed, but the chairs are more than comfortable enough for us. Neither T and I want to linger with just one remaining stretch between us and RV4 (Sutherland). The problem with not wanting to linger is the hosts are so hospitable, and there are so many interesting stories to share that even the most determined efforts at a quick pitstop start to wilt in the heat of the afternoon sun. As fresh pap (porridge) arrives we learn that the guy helping out is the brother of the owner, and the lads are just home from boarding school in Ceres for the holidays. By the time we have also exchanged stories with the three enthusiastic and friendly development riders, Tiaan has already rolled in and left again, and the afternoon is inching towards evening. As difficult as it is, the time has come to put socks and shoes back on, kit up, and tear ourselves away. My Achilles is troubling swollen as we do so – considerably more than when we left Loxton. I’m beginning to doubt how much more it can possibly take before it blows completely and ends my ride. We roll out with the development guys – for the short distance of the farm track we’re a group of five, and there can’t be many more riders left behind us on the road. Given how close we are to the tail, it was tempting to laugh when one of the guys mentioned he’s going to try and win the development category next year. But it’s entirely possible he could – The Munga is the sort of race where you don’t always choose the pace you ride. Myriad circumstances could have slowed him down, so the fact that he is riding with us isn’t really any indication of what his capabilities might be for a future attempt. He has youth on his side too, which is evident as all three quickly distance themselves from T and I once we rejoin the gravel road. The wind is howling directly into our faces and every time the road rolls upward, which it does often, the pain in my right ankle rises with it. I don’t often lose faith on long rides, but I can feel my self-belief ebbing away with every turn of the pedals. It’s 65km to Sutherland, with some of the nastiest climbs of the ride so far. Even fully fit and without the wind it’d be a challenge, but as things stand it’s beginning to feel impossible. Once again I find myself hearing Alex’s words in my mind – ‘be still, and he will find you’. I know what I need, but far out here, as afternoon shadows begin to lengthen on this remote and empty road it seems impossible that it would come to my aid. Until it does. I wave frantically as the ER24 bakkie passes me, hoping they will understand that I’m not just being friendly. As they slow down in front my prayers are quite literally answered. They have strapping and park just up ahead where T is waiting on the crest of the current rise. I hop into the passenger seat of the bakkie, and ask T to wheel my bike to the back. For a brief moment he glares at me angrily, and starts to argue that I cannot quit. A visible wave of relief flashes across his face though when he realises I just want him to prop it out of the way whilst I sit and let my ankle hang loosely so that the medic can strap it. I’ll never know how or if I could have managed the battering terrain into Sutherland without the tight web of bandages that make it hard to get my sock and shoe back on, but as we start back out again there’s a secure and solid feeling of confidence in my right leg. For the first time in hours, I can pedal again, maybe not easily, but certainly freely and with much less pain. As if to emphasize just how opportune this piece of timing was, we’re only a few kilometers further along before a wall of mountains rise up inexorably in front of us. Exhibiting a brilliant dose of commercial savvy, right at the foot of the climb a group of young farm lads have stuck out a hand written sign advertising cool drinks and snacks. Even without the promise of chocolate it would be hard to resist such enterprise. We pull in and buy cokes and snack bars from them which we quickly wolf down. As with WP8, these kids are also home from boarding school for the holidays – this time in Worcester. Two of children are the farm owner’s and a third is one of the farm workers’, perhaps the foreman. All of them seem to share a common interest in the ride and riders and eagerly press us for stories, and share their accounts of other riders who have stopped by. It’s almost embarrassing to answer their questions on how much our bikes and the other rider’s bikes cost. But the least we can do is honour the inquiring nature of their young minds. So we respond honestly and (as much as we can) with simple facts rather than an evasive apology. The initial climb was a long but not especially steep slog. As we sped down again the rows of successively taller ramparts up ahead made if fairly clear that this was just the opening salvo – the short valley we pelted down into was a brief interlude before the climbs to come. How many of them remained wasn’t clear and, without studying the Strava profile, my faded memories now wouldn’t be able to recall. At the crest of perhaps the second or third ramp we’d climbed onto a flattish plain, now high enough to have risen back up in the wind. Rolling slowly on in the fading evening light, there was a definite lightness of spirit and renewed sense of purpose and optimism. The barren, windswept beauty of the landscape all around us lit in the orange glow of the dipping sun was breathtaking. And on the ridge in front of us, the turrets of the Sutherland telescopes loomed large, now just one hillside away, even though our path to reaching them wasn’t immediately obvious. Faced with such portents, the pain which had dominated my mind and nearly sank my spirits just 20km or so back had completely vanished. However many times I learn this lesson it still surprises me. 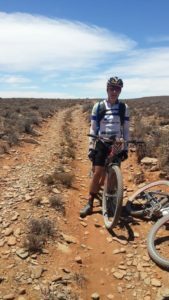 The simple act of managing to pedal on, is sometimes all it takes to change ones ride – albeit in this case, the medics’ attention was a crucial factor in my being able to do that. Because of the 3-D nature when looking at them.. the first time I glanced up.. I thought that a huge tree was overhanging the road that we were travelling on.. because it looked as if I was looking through tree branches up at the stars. I had to rationalise to myself what I was actually seeing… it was unreal. The climbing wasn’t quite done though even then. Shortly after we rejoined tar road and the entry to Sutherland’s Observatory, the route pitched up again – this time the gradient clearly visible ahead as our lights picked out an ever rising set of brightly reflective road markers. It seemed to take an age to get up and over this ‘last stretch’ but when we did, doubt entered both our minds and we pulled over to the side of the road. Every previous RV town had departed from the main road just before the town and taken a farm track over the last few kilometers. The tracks on both our Garmins suggested otherwise – a straight run down the tar road into town. We desperately tried to recall the briefings – how many towns had Alex warned us to be careful of the approach into? Had Sutherland been one of them? Neither of us wanted to reach the RV only to have to turn around and slog back up an 18km climb to correct a routing mistake. But nothing we could find or drag back from our memories suggested otherwise. So with a shrug, we hurtled down into town covering the distance ridiculously fast compared to the previous 18km. As we did so, T commented on the worrying sounds occasionally emanating from the direction of his front wheel. Newly serviced, it was way too early for the bearings to be showing signs of strain, but with no signs of disc rub, neither of us could think of what else the sound could be. Hopefully the mechanic at the RV would be able to locate and fix whatever problem was lurking in there. I must have made that Porterville-Piketberg comment to Ryan, Francois and Paul around exactly that same stretch of road. Great minds think alike and fools never differ. Yep Nico, ek onthou. Rob, we did the Moon/Mars technical pass down to WP 8 at midnight. Was probably better not to see that hell in daylight…..
Nice – although I did actually quite enjoy that stretch, lumpy as it was. That last 10km into Fraiserburg also took forever for me, and was painfully bumpy. According to Strava, I took a lot longer than you! Thx. Only time I’ve had to ride with Achilles pain before was right at the end of a long Audax. This was much further – was very glad of the strapping.